Perfect weekday dinner with tender chicken and bell pepper in a tasty garlicky sauce! Curries are so versatile and whenever I don’t know what to cook I rely on a curry to save my growling stomach! Chicken cooked to tender perfection with veggies and a delicious sauce on top of a mountain of rice. A satisfying and scrumptious treat, perfect for an easy weekday dinner! The green Thai curry paste gives the curry a nice little zing. Combined with the garlic, onion and dry sherry you end up in curry heaven. 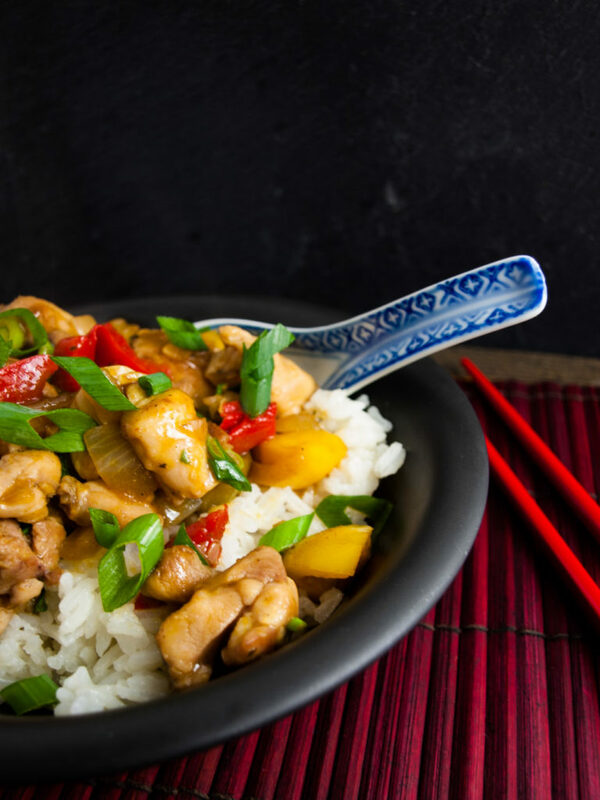 The most authentic way to make this Asian curry would be to use Shaoxing rice wine. However, I hardly ever have it at hand, therefore I generally use dry sherry. Do you have any other veggies in the fridge that need to go? Chop them up and throw ‘em in! This is the awesome part about curry – they are versatile and so easy to change up. Even if you use the same sauce, you will never get bored if you switch up your veggies and meats in them. What are you waiting for? Make yourself a delicious Asian treat! Look at this delicious tender chicken weekday dinner! Finely dice the onion and the garlic. Cut the three bell peppers into pieces, the spring onions into thin rings and the chicken thighs into bite sized cubes. Put a large frying pan onto high heat. Add 2 tablespoons of oil and stir-fry the chicken pieces until browned on all sides. Remove the chicken from the pan onto a plate. It does not have to be cooked fully through yet. Add the remaining oil to the pan, as well as the onion and garlic. Fry for 1 minute. Add the bell pepper pieces and stir-fry for 3 minutes on high heat. Pour in the stock, add curry paste, sherry and soy sauce. Simmer for 10 minutes on medium-high heat until bell pepper is soft. Add chicken back into the pan and simmer for another 5 minutes until chicken is cooked through. Sprinkle over sliced spring onions and give another good stir. Serve your delicious piping hot curry with rice and garnish with some more spring onion!